Combining a stereo pitch shifter with digital delay lines and analog-style filters, this plug-in is capable of accurately simulating vintage digital pitch and harmonizing effects, as well as creating interesting sounds in its own right. 1. Graphics updated for legibility on high-resolution monitors. 2. .aupreset files added in the appropriate location on OS X for Ableton Live AU users. 3. Missing preset bug in Logic fixed. 4. Input and output levels in previous version defaulted to -9dB. We have changed this to 0dB on both controls. 5. New DRM-free digitally-signed installers. This is a recommended update for all users. The Discord 3 installer on OS X has been updated to 1.1.1a to fix a problem some users were experiencing installing the 64-bit AudioUnit. The plug-ins are unchanged; only the installer itself is updated. We have made the version 1.1.0 installer available to existing Discord3 customers. 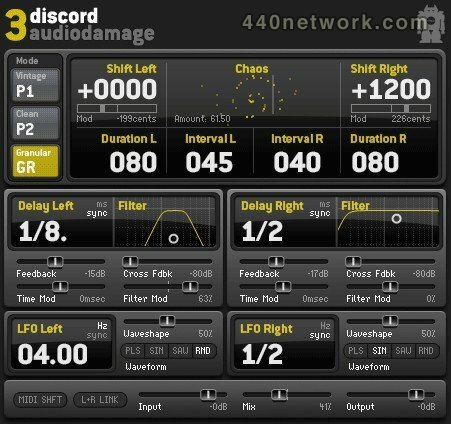 This update includes both 32-bit and 64-bit versions of both the VST and AU of Discord3. If you do not use a 64-bit host, there is no reason to do this update at this time. The "beep/honk" bug that occurred occasionally in the Granular engine has been fixed. Buffer Size control. 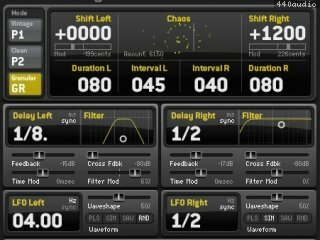 The P1 and P2 algorithms introduce a buffer size control for each side that allows user control over the windowing of the algorithms, for fine tuning the shifting effect to the input material, or for special effects. New filter control. The pair of filters for each delay have been replaced with a single X/Y control for a bandpass filter's width and center frequency, for easy programming and new feedback effects. Completely redesigned user interface. Discord3 has introduced new controls to the Discord family; rather than knobs, which are poorly suited to fine control on a computer screen, we have introduced a numerical control. Each number in the value can be grabbed and individually adjusted. Furthermore, we have replaced all remaining knobs with sliders, for easier programming on a computer screen. as well; if your AudioUnit host allows sending MIDI to an insert effect, Discord3 AU will respond to MIDI Learn just like the VST always has. It seems a Eventide of the heroic times, but without noises. Great price!